This is the second part in what ought to be a single essay. The world of offshore financial centers is historically and functionally an extension of Eurodollar market. Although, unlike the Eurodollar market – which exists inside the UK but outside UK’s regulatory jurisdiction and hence, outside any regulatory jurisdiction – these offshore centers are located in ostensibly sovereign territorial jurisdictions. This is a bad joke. These are microstates that have been captured by global financial interests trying to escape from democratic control at home. I must confess that I had significantly underestimated the true extent and significance of offshore finance. Like everyone else not intimately familiar with the plumbing of the world economy, I regarded it as a peripheral phenomena that was mostly about tax evasion by corporations and the superrich. Moreover, my understanding was that becoming a tax haven was a strategy used by small island nations to attract global capital. Nothing could be further from the truth. 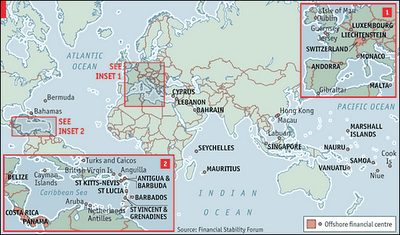 To think of these places as tax havens is to misunderstand their true role in the global economy. More important than their vanishing tax rates is the fact that these are secrecy jurisdictions. They allow vast pools of global capital to avoid the laws and regulations of center countries. Further, they have been used as a bludgeon to spearhead a rollback of regulation and taxes in the center countries with the familiar dynamic of competitive deregulation and the ‘race to the bottom’; and thereby, played a pivotal role in the resurrection of financial hegemony. This, then, is the hidden story of the reemergence of global finance. Secrecy jurisdictions are not self-selected random states that are exercising their sovereign right to create financial centers by offering attractive terms to foreign investors. These jurisdictions have been captured by global capital: financiers from London and New York wrote the fine print of their laws and regulations and exercise absolute control from behind the scenes. There are three major clusters of secrecy jurisdictions. An old cluster of European microstates, a British zone centered at the City of London, and a zone of influence centered on the United States. There is an old one in continental Europe which includes Switzerland, Luxemburg, the Netherlands, Monaco, and Andorra. The bankers in Geneva were providing secret banking services for the European elites since at least the 18th century. Luxembourg specializes in holding companies exempt from income taxes and has around $2.5 trillion dollars, making it one of the biggest tax havens in the world. The second cluster – the biggest by a margin – is the spiderweb spun by the City of London in concentric circles. The City of London itself is the biggest secrecy jurisdiction in the world, hosting perhaps a sixth of the world’s offshore assets. A first ring consists of the crown dependencies of Jersey, Guernsey, and the Isle of Man. There are about a trillion dollars parked offshore in this ring, accounting for around $30 billion is lost tax revenue. The second ring consists of the British Overseas Territories – the last surviving outposts of the British Empire – controlled by the City of London but ostensibly under native ‘self-rule’. This device allows Britain to claim that it has no jurisdiction over these territories while the laws and regulations are drawn up and fine-tuned by foreign investors with no input from the natives. It includes the biggest of the tax havens: the Cayman Islands, the British Virgin Islands, Bermuda, Turks and Caicos, and Gibraltar. The Cayman Islands has the distinction of hosting three-quarters of the world’s hedge funds. Not that you will find any hedge fund managers working here. The $1.9 trillion deposited in the Cayman Islands sits there only in an accounting sense: the hedge fund speculator manipulates numbers on a screen in London and money moves in nanoseconds halfway around the globe. Bermuda has a different model. It’s a reinsurance hub with around a hundred billion dollars of capital. Due to US regulations – insurance is highly regulated every where, including the United States – foreign firms writing American business need the employees and offices located offshore to avoid US taxes. It is therefore a more “legitimate” model of an offshore financial center. [Disclaimer: I worked for a year in Bermuda as an actuary for a reinsurance company.] This is certainly not the case for the other sixty ‘treasure islands’. A third ring consists of islands not directly controlled by Britain but with strong colonial links. This includes Singapore, Hong Kong, the Bahamas, Ireland, Dubai, and Bahrain et cetera. Hong Kong is the biggest investor in China for the obvious reason that wealthy Chinese park their funds in Hong Kong for banking secrecy and then invest it back again in China, thus qualifying as foreign direct investment. Something similar is going on everywhere: Cyprus is the biggest investor in Russia, Mauritius in India, and so on and so forth. The United States emerged as a secrecy jurisdiction in the 1970s after a long run staunchly opposing banking secrecy: “In general, the United States has played a pioneering role in devising ways to defend itself against foreign tax havens, but has largely failed to address its own role in attracting illicit financial flows and supporting tax evasion”. The US has seen a number of secrecy jurisdiction pop up at home, the most important of which are Delaware, Wyoming and Nevada, which have become “specialists in offering low-cost and very strong forms of almost unregulated corporate secrecy, which has attracted illicit money, and even terrorist money, from around the globe”. Further offshore, the US has a network of satellite jurisdictions in the Caribbean and the Pacific, including Panama, the US Virgin Islands and the Marshall Islands. This three-tiered British spiderweb serves the City by funneling money to London: the web catches money flowing from rich westerners, corrupt African dictators, and post-Soviet oligarchs, and channels it to the City. It also lets the City get involved in business that may be forbidden in Britain or attract attention, farming out the real monkey business to the jurisdictions far removed from the City to maintain plausible deniability. Illicit arms dealers, terrorists, drug traffickers, Russian oligarchs, corrupt officials and dictators – the dirty stuff – account for perhaps a third of the world’s thirty or forty trillion in offshore financial assets. Two-thirds – a supermajority – is accounted for by the central pillars of global capitalism. The primary users of this web of offshore financial centers are not the superrich and the corrupt, but western corporations. For instance, a recent report in the New York Times describes how Apple, the largest company in the world by market capitalization, uses a series of offshore shell companies to reduce its tax bill to single digits. The problem of the rich avoiding taxes is even more severe in the Third World. In poor countries the tax base, i.e., the middle class, is a tiny fraction of the populace. Moreover, the distribution of income and wealth is even more skewed than the rich market economies of the Atlantic. Furthermore, poor countries face a higher interest rates than rich ones, so that deficit spending is much more expensive and makes them vulnerable to debt and currency crises. The cost of losing a few billion dollars of reliable tax revenue to a poor country does not mean that the planned high-speed rail cannot be built, it means that a few hundred thousand people do not have access to sanitation and potable water. Tax is not just about money and financial aid is not a substitute for taxes. Real democracy is impossible without taxes. Aid creates dependencies and divorces people from public affairs. Instead of pressuring their elites to reform state institutions and governance, aid makes poor communities look towards western donors and NGOs. Paying taxes makes people invested in the state. It makes them concerned about how their money is spent. Neither the resource curse of the oil monarchies, which makes taxes unnecessary, nor large scale poverty of sub-Saharan Africa who get more aid than tax revenue, are conducive to the strengthening of public institutions and democracy. The global south lost a trillion dollars in illicit financials outflows in 2006 alone, compared to a hundred billion dollars in global aid. Africa is a net creditor to the rest of the world: it lost $607 billion to capital flight between 1970-2004, which its total external debt stood at $227 billion. How does the offshore system of secrecy jurisdictions enlarge and perpetuate the anti-market? Suppose an oligarch controls one of two dominant firms in a product market where price competition is putting pressure on profit margins, and the regulators won’t allow a merger. The oligarch can acquire control of the second firm by routing the capital through a secrecy jurisdiction without tipping off the regulators. This effectively monopolizes the industry while maintaining the façade of market competition. Secrecy jurisdictions also play a key role in insider trading. The recent case of the Canadian speculator who settled with the S.E.C. highlights this nexus. In order to trade ahead of an impending merger, the trader used his account in the Crown dependency of Jersey. The only reason he got caught was because he was corresponding with his Jersey banker by email, something that the S.E.C. could get its hands on once it obtained a warrant. Rookie mistake. The vast majority of traders who know what they are doing cannot be caught as an immediate consequence of the banking secrecy of these jurisdictions. An overlooked effect of offshore finance is in the distortion and overstatement of FDI numbers. The biggest source of FDI into the US is Switzerland, in Russia it’s Cyprus, in China it’s Hong Kong, in India it’s Mauritius and so on and so forth. This is quite transparently an accounting trick. These are domestic plutocrats routing their monies through offshore jurisdictions to escape taxes and regulation. The offshore system is not peripheral but central to the plumbing of global finance. The recent exposure of data from the British Virgin Islands, the Madoff affair, the role of banks’ offshore Special Purpose Vehicles in the recent financial crisis, the troubles in Cyprus, and the attention paid to tax avoidance by major corporations like Apple, all point toward some sort of legislative movement in the center countries. Indeed, the United States has repeatedly announced that it intends to take serious action against ‘tax haven abuse’. Maybe something marginal can pass amid a lot of hoopla and self-congratulation. I wouldn’t hold my breadth though. The world of offshore finance is a central pillar of the plutocrats’ strategy to maximize wealth and power, and avoid democratic control. Given the political economy of the US state, this hidden web of offshore financial centers is not going anywhere. What should we conclude from this foray into the offshore world? Perhaps the first thing to observe is that we may have misunderstood the chronological sequence of the three pillars of the global economic order: globalization, neoliberalism, and financialization. The last here is not meant in the sense of the dominance of finance. Rather, I am talking about the advent of freely-flowing international capital. By the late 1960s, the pool of unregulated, globally mobile capital had already grown powerful enough to force the hand of the center countries. The policy autonomy of even the most powerful states became increasingly constrained by the ‘virtual senate’ of the market. Perhaps one could claim that it was a conscious decision of the sovereign state of the United Kingdom that broke the back of the ‘quasi-public international financial order’. This is inaccurate. The only institution that could’ve exercised juridical authority over the emergent Eurodollar market was the Bank of England. Before and after nationalization, the Bank has played the role of the protector of the City. It sits between the UK government and the City, shielding the latter from the former. The Bank’s early decision to leave the Eurodollar market unregulated stemmed from its long-term desire to see the City reconstituted as the dominant international financial center. To cut a long story short: capital broke free first, and once this pool was large enough, it forced the center countries to relinquish their policy autonomy. First with respect to their exchange rates (Britain 1967, Germany 1969, US 1971) culminating in the collapse of the Bretton Woods system in 1973, and then their control over capital flows (US 1974, Britain 1975). The onset of stagflation in the United States in the mid-1970s, and the inability of standard Keynesian methods to stabilize the macroeconomy made conditions ripe for the implementation of the neoliberal agenda. The market played a key role in putting pressure on the Carter administration. As inflationary expectations kept rising, the dollar came under attack. As the crisis of the dollar escalated in 1978-80, the administration ran out of options. Carter was essentially forced to appoint a known inflation hawk, Paul Volcker, as chairman of the Federal Reserve. As chair of the Federal Reserve Bank of New York – the state institution closest to Wall Street – he was in tune with the bankers’ preference for a strong dollar. He immediately set upon a radical tightening of monetary policy that would forever alter the balance of power between finance and industry. The Depository Institutions Deregulation and Monetary Control Act of 1980, that phased out Regulation Q interest rate ceilings and deregulated interest rates, laid the basis for the ‘Copernican revolution’ that would ‘split the atom’ of the ‘Chandlerian corporation’: facing uncertainty in their cost of capital (and sharply higher interest rates as a result of the Volcker shock), US firms reoriented themselves to the financial markets. Instead of powering their expansion through their internal surpluses, they were forced to disgorge these funds to the market. One must therefore conclude that it was the reemergence of global finance that forced the hand of the policymakers and ushered in the neoliberal counter-revolution. Note that the most important policy shifts took place when the Democrats controlled the Senate, the House, and the White House. Reagan then extended, implemented, and institutionalized the neoliberal economic order, the contours of which were already in place by 1980. This pair of essays also solves a critical puzzle about the current regime of accumulation à la Braudel. There is a strong tendency in the world economy to be centered. Since the very beginning of capitalism in the Italian city-states, there has always been a ‘leading city’ that served as the ‘organizing center’. Given the overwhelming dominance of the United States in the international system since 1945, how is it that London survived as a rival to New York? Indeed, it is the dominant center of international finance, leading New York in currency trading, international bond issues, and even trade in critical commodities like oil. The reason for this anomaly is now clear. Given the financial repression of the New Deal-era in the US, the reemergence of global finance was effected through the reconstitution of the pre-1931 institutional structures centered at the City of London. The remnants of the British empire were then set up as a spiderweb of offshore financial centers, reinforcing and perpetuating the dominance of the City of London. Last point to ponder before I close. Even if we somehow manage to rollback neoliberal state policies, the institutional structures of financial hegemony are not going anywhere. Tax Justice Network. Mapping Financial Secrecy: USA. Rep. October 4, 2011. Shaxson, Nicholas. Treasure Islands: Uncovering the Damage of Offshore Banking and Tax Havens. New York City: Palgrave Macmillan, 2011. Print. to mention that I have trtuly loved browsing your blog posts.